No other novel of 2015 has taken up the issue of migration in a more focused and nuanced way and with more narrative force than has Jenny Erpenbeck’s “Gehen, ging, gegangen”. Jenny Erpenbeck has written the book of the year. Not without reason Frank Witzel’s novel Die Erfindung der Roten Armee Fraktion durch einen manisch-depressiven Teenager im Sommer 1969 (i.e. The Invention of the Red Army Faction by a Manic-Depressive Teenager in the Summer of 1969) received the coveted German Book Prize in 2015, but no other current German novel has come to grips with migration, the issue that has dominated the winter of 2015/2016, in so focused and nuanced a way and with more narrative force than has Jenny Erpenbeck’s Gehen, ging, gegangen (Go, Went, Gone). 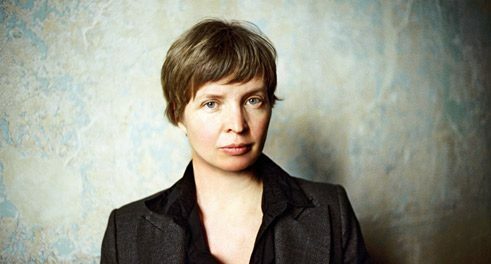 Erpenbeck, who was born in East Berlin in 1967 and has won numerous awards for her novels, is not counted as one of those writers who take up contemporary issues and process them with a good feel for the market. No serious writer of course who would allow external circumstances to dictate which theme his next novel would treat. Ideally, the writer is a seismograph who anticipates and develops something in the air that is vaguely discernible, hardly perceptible. So it was with Erpenbeck when she began her research. Her readiness to listen to immigrants and to learn something about their fates formed the basis for a novel saturated in reality, which tells us much about immigrants but also about our society. Erpenbeck describes two worlds, which ostensibly have nothing to do with each other. Her hero is the retired professor Richard. Out of pure curiosity he sets off for the refugee protest camp at the Oranienplatz in Berlin because he wants to know what motives move the refugees stranded in the city, about whom he hears incessant reports in the media. He wants to know the fates behind the abstract numbers. The people come from Africa, from countries whose capitals Richard, the educated member of the middle-class, often does not even know the name of. He spent most of his life in former East Germany and feels himself to be someone who also has overnight somehow irrevocably lost his country. On one side is the widowed classical philologist Richard; on the other the young men from Guinea, Ghana, Sierra Leone, Mali, whose lives and mindscapes are so fundamentally different from his. At first they are connected only by the human condition, and it is one of the strengths of this novel that Erpenbeck nowhere attempts to deny or gloss over the chasm, the immense strangeness, and so too the disconcerting and disturbing element of these antipodean encounters. While Richard occupies himself more and more intensely with the refugees, helps them and gives them German lessons, the reader too becomes increasingly familiar with the specific stranger. He grasps where the problems, which the novel refuses to sweep under the table, have their origin: these young man are not allowed to work or travel; the German bureaucracy and the legislation of the European Union have damned them to idleness. Without prospects, they hang around together, some with more, some with less patience. And some too with the readiness to take their destiny into their own hands, if need be by violence. In the evening Richard writes down the life stories these men willingly confide to him. They are individual fates, but invariably stamped by the same pattern: flight or expulsion from the home village, migration across Africa, experienced brutality, helplessness and loss – of parents, brothers and sisters, friends; and finally the nocturnal boat trips across the Mediterranean, on which many perish. Thus Gehen, ging, gegangen is also a compendium of refugees’ stories. Anyone who wants to learn something about the causes of migration need only read this novel, with its clear, straightforward and, as always with Erpenbeck, tremendously condensed language. Here the authenticity of the novel – that Erpenbeck approached her theme very much as does her main character – stands it in stead. So as no longer to learn about refugees only from the media, she visited the camp at the Oranienplatz. She wanted to form her own judgement based on an unbiased view – a “privilege” of the writer, as she has said in an interview, but also “his responsibility”. Since beginning with her research and writing in the summer of 2014, Erpenbeck has met part of this responsibility by concerning herself several hours a day with the young refugees, helping them in dealing with the German bureaucracy and in coping with everyday life. In spite of this very personal commitment, Gehen, ging, gegangen is not social reportage relying on pity, indignation and identification. Erpenbeck formed the stories told her by the young men into the reality of a novel, in which the fusion of the found and the invented yields an indistinguishable amalgam. Over it all always stands one question: the question about the human condition. Matthias Bischoff is a cultural journalist based in Frankfurt am Main.